A tall gentleman is standing at the center of the stage. All eyes in the audience are glued to him. The audience is in a state of confusion and is skeptical after what he announced. The hall is so silent that one could hear the heartbeat of the person sitting next to them. The tall gentleman puts his hand to obstruct light from the lamp. Voila! The HD video being played on the screen has stopped. What follows next is a roar of applause. “Once again, still don’t believe”, says the gentleman who’s slightly bent on his knees while moving his palm to obstruct the light again. An eye of a fly stretches over the screen as the video streaming pauses again. The audience is still in awe. He streamed an HD video using an LED. It was nothing less than magic. It happened for the first time in human history. Nobody had witnessed providing access to the internet from ordinary LEDs before. The guy was indeed a magician. Not the one who tricks his audience; but the one who makes an LED do wonders. He is a scientist. An inventor. A real magician that tricks real world problems and not his audience. Well, it’s time to pull the curtains. The stage was of TED. The gentleman was none other than Prof. Harald Haas. He has just demonstrated how LiFi works. And how we can use a light bulb to illuminate as well as to communicate. After his demonstration, the communication scientists around the globe were delighted. And why wouldn’t they? Prof Haas gave them a whole new concept to work on. Since his TED Talk on LiFi on August 2011, much has been contributed by communication researchers around the globe to provide an access to the internet from light see the light of a day. Today in our brief time together, both of us, yes you and me, will be exploring how the research unfolded with time. So lean back and grab a cup of coffee as this is going to be quite a ride. 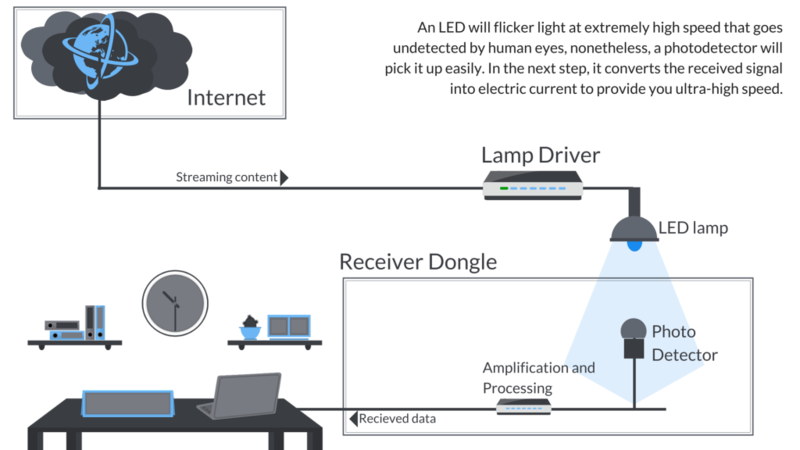 What Is LiFi And How LiFi Works? Which Companies Are Researching In LiFi? LiFi Vs. WiFi: What’s The Difference And Why LiFi Can’t Replace WiFi? Quite a big analysis, isn’t it? Okay, let me save you the time that you might spend in jumping from one section to another. I’ve created a PDF having all the insights listed above that you can download using this link. You can keep it for offline reading or sharing with your friends who are interested in research in LiFi. Let’s start with what was happening before Aug 2011 i.e. the public release of LiFi. Now to find that out, the goddess of research gave me two options. One, explore all the research papers of the LiFi technology and two, explore the patents filed in LiFi. The onus was on me to decide. I was in confusion on how to go about it. Research papers are good. In fact, they are awesome. But there is a catch. Collecting all research papers on LiFi is one hell of a task. The first problem is that there are multiple publishing platforms; second, many are not available for public use; third, two research papers could demonstrate a single concept. So numbers of research papers published might not give me what I was looking for. So I was left with patents which, on the contrary, can be accessed from a single database, are novel, and are readily available. Hence, I created few key strings – a conventional method of patent search – and executed them on Thomson. What I got was gold, but with impurities. So the next task I had in hand was to separate contaminates (junk data) from gold (insights). As soon as I finished, what I was left with was pure gold. Now the next task was to polish it and make it shine. In other words, I had to derive insights. But before I let you know how I rolled, let’s first discuss what exactly LiFi is, how it’s better than WiFi, its forefather, and the most important question – How it works? You may be in a room – office, home, restaurant – or maybe in a vehicle while reading this post. And I am sure that you can easily spot a light bulb around you. In the future, that light bulb could be your wireless hotspot. You and I will be in a world where billions of light bulbs we use today for illumination purpose, will be used for communication and ultra-fast internet. The wireless hotspots which these bulbs will create provide internet speed that isn’t possible with the current WiFi router you have in your room. In February of 2015, researchers at Oxford University achieved a speed of 224 Gbps through LiFi. You can download 20 HD movies with that speed, in just one second. When a constant current is applied to an LED [light-emitting-diode] light-bulb, a constant stream of photons is emitted from the bulb which is observed as visible light. If the current is varied slowly, the output intensity of the light dims up and down. Because LED bulbs are semiconductor devices, the current, and hence the optical output, can be modulated at extremely high speeds which can be detected by a photo-detector device and converted back to electrical current. The intensity modulation is imperceptible to the human eye, and thus communication is just as seamless as RF [radio frequency technology]. Using this technique, high-speed information can be transmitted from an LED light-bulb. As I have mentioned, I used patent analytics to decipher how things have been moving for past few years in LiFi. In the below chart, I have plotted patent filing against year. The chart below depicts the state of research across the globe in the visible light communication or LiFi technology. One thing worth noting is that though LiFi was first publicly disclosed in August 2011, the history of lifi dates back to 2006. I’ve divided the above chart into two phases: first before Prof. Haas’ disclosure and second after his disclosure. We can see that in the first phase, the research activity in the domain was quite constant. There is not any significant increase or decrease in patent filing activities in that phase. However, in the second phase, which is after 2011, there is a significant increase in patent filing activities. A 66% rise in patent filings was observed in 2012 as compared to 2011. Similarly, when I compared all of the patents filed during 2012-2014 with 2006-2011, I find that 26% more patents were filed in former period than the latter. Only 8 patents were filed in 2015. But this should not be considered as a decrease in research activities. In general, a patent application takes 1-2 years to get published. And patents filed in 2015 haven’t seen the light of the day yet. Which Companies are working on LiFi to make it A household thing of the Future? The visible light communication industry has come a long way since its inception. It is expected to be worth $113 billion by 2022. Without a doubt, we are going to see tech goliaths and some new entities fighting to grab their share in the market. This brings another question on to the table: Who all are going to fight that LiFi war? I again used the same patent dataset to find the answer to the question, which could be found in the chart below. Samsung, with 26 patents, is at the top spot followed by the University of Edinburgh having filed 6 patents. ETRI is in the third spot, well known for developing the LubiNet visible light technology. Lubinet can deliver digital data via LED lights. The next two spots are occupied by Universities too. This is something I was already expecting as a university is the birthplace of LiFi. 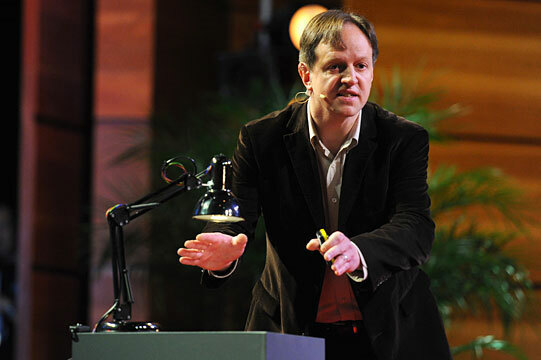 Professor Harald Haas, the father of LiFi – was associated with the University of Edinburgh, which is at 5th spot – is the inventor of many patents filed by the university. Other than that, Professor Haas has filed few patents with NTT DOCOMO and Jacobs University Bremen as well. Professor Haas has also established PureLiFi in 2012. His company focuses on the development of visible light communications. Apart from tech goliaths – Samsung, NTT Docomo, Panasonic here – few ingenious startups– Koriist, SamsaraHQ, and Sigfox, etc – are also making an effort to shine in LiFi industry. In the next article in this series, I will unveil the state of research before 2011 and the top ten countries making efforts to convert your light bulb into a wireless hotspot. Spoiler alert: You will not find either USA or Japan at the top. So, which country is at the top? Is Prof Haas the top inventor? Well, all of your answers are in the second part of this series. Also, the second article contains a link to download the whole LiFi patent landscape study as a printable pdf. What are you waiting for? Click here to read the second article of LiFi Series. But please when will the next post be published ? Ali, we are publishing that soon. Have you subscribed to our email updates? If yes, I will notify you before anyone else. Can you please provide me the next article written on LiFi tech and this article was very impressive as it included almost all the information that I needed to understand this technology. After reading few articles on LiFi, I came to know that no one is talking about any restraints for this technology. So, can you please provide me some of your expertise opinion on this topic if possible. Excellent article, coming from the LED retrofit lighting design arena from Fluorescent, Hid and Incandescent this is ground breaking technology see as though me opinion WiFi will become very thin and cluttered in the near future and I would ask to please include me in all correspondence with you ppl. typed quickly, sorry for the grammar issues after reading….Thanks in Advance.